The condition of having an underactive thyroid is called hypothyroidism. 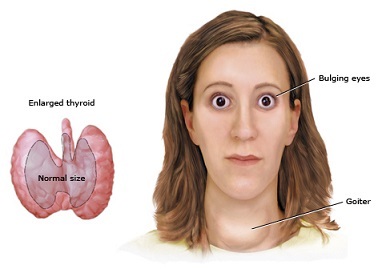 This is a state of thyroid hormone deficiency or lack of thyroid hormones. It may be caused by an abnormality in the thyroid gland itself which is called primary hypothyroidism or by an insufficient level of thyroid stimulating hormone (TSH) causing under stimulation of the thyroid gland resulting to low thyroid hormone production. 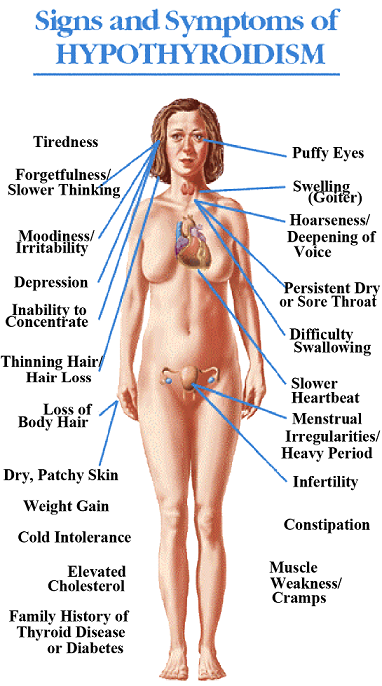 Signs and symptoms of thyroid hormone deficiency reflect the need for thyroid hormones in metabolism and its effect on all organs. Patients present with thickened features and puffy appearance. Swelling around the eyes and swelling of the legs can be seen. The skin is pale and cool as a result of constriction of the blood vessels. The pallor can also be attributed to anemia. Patients usually complain of cold intolerance. There will also be dry and coarse skin due to reduced secretion of the sebaceous and sweat glands. Other signs and symptoms include poor wound healing, increased bruising, and dry, brittle hair. The heart rate slows down with low thyroid hormones. Cholesterol levels increase with decreasing thyroid hormone levels but can be reversed with thyroid hormone replacement. Appetite maybe reduced but there is usually weight gain despite poor appetite and this is attributed to the water retention seen in these patients. They may also complain of constipation. Some studies show that low levels of thyroid hormones can increase the occurrence of gallstones.